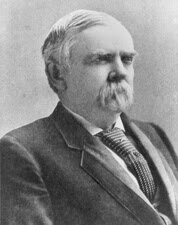 George Graham Vest was a U.S. politician. Born in Frankfort, Kentucky, he was known for his skills in oration and debate. Vest, a lawyer as well as a politician, served as a Missouri Congressman, a Confederate Congressman during the Civil War, and finally a US Senator. He is best known for his "a man's best friend" closing arguments from the trial in which damages were sought for the killing of a dog named Old Drum on October 18, 1869.